Do you ever review your lecture notes after you take them? Most people don’t… mostly because it seems like a lot of work and they don’t know how. Tune in for Part 3 of the Anti-Boring Summer Series, where Gretchen walks you through a simple model for how to process, or ‘hone,’ your notes so you actually learn the information your teachers is sharing. More tools to fill your study toolbox? 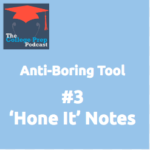 Check out the Anti-Boring Approach to Powerful Studying. Gretchen’s training for educators? Check out The Art of Inspiring Students to Study Strategically? Summer coaching? Check out these certified Anti-Boring Approach Coaches.